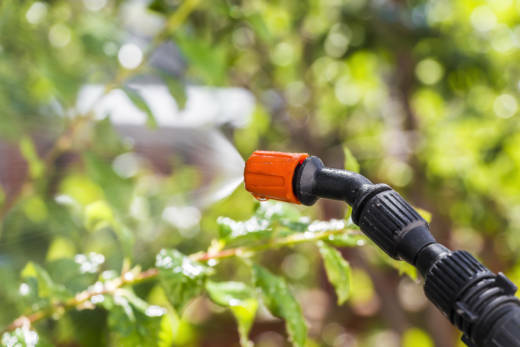 A California judge has ordered state officials to stop spraying chemicals to kill invasive insects until they prove they can do it safely. Sacramento County Superior Court Judge Timothy Frawley determined current practices to extinguish plants pests pose a risk to the environment. This battle began in 2007 when former Gov. Arnold Schwarzenegger's administration used airplanes to spray chemicals over Bay Area communities to kill the light brown apple moth. The state worried the insect would threaten the $45 billion agriculture industry. Aerial spraying angered some residents and sparked lawsuits. Even though the eradication effort ceased in 2008, the issue inspired environmental advocates to push for tighter protections when the California Department of Food and Agriculture attacks non-native insects. Now a decade later, the court has issued an injunction that requires the state to stop using 79 pesticides to ward off foreign bugs until officials address the impacts that spraying has on public health and the environment. The injunction takes effect in about two weeks. Farmers can still spray their fields and officials can continue deploying non-chemical ways to wipe out pests. The ruling does not affect efforts to eradicate invasive species that carry human diseases like the Zika virus. The decision is a victory for 11 conservation and food safety organizations as well as the City of Berkeley, who argued that the state's current program violates many California environmental laws. "Officials have had the ability to do whatever they feel they need to do to manage any pest for thirty years," says Paul Towers, advocate with Pesticide Action Network. He wants the state to allow for more public notice and scrutiny.